William Godwin was not only the husband of Mary Wollstonecraft and the father of their daughter Mary – to become the second Mrs Shelley in 1817 – but was also a great intellectual influence upon her. 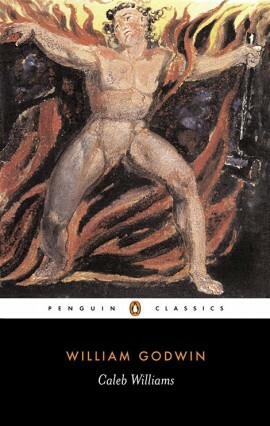 Frankenstein can be seen as a ‘dystopian’ novel in which Creator and Creature become locked into an inescapably maddening ‘double’ relationship with disastrous results. Twenty four years before Mary’s book was published, the primary characters of Godwin’s Caleb Williams, Squire Falkland and his secretary Caleb, had also been locked into a kind of doppelganger relationship, but then the dynamic had also involved political pursuit as well a strange and (in terms of the literary novel) fascinatingly new psychologically inescapable coupling. Originally published in 1794, when (as Godwin’s original Preface stated) ‘terror was the order of the day’ not only in Revolutionary Paris, but also in an anxious British state now at war with France, I have characterised the work as a ‘political gothic’ novel. I gained a Ph.D for an in-depth study of Caleb Williams, so great did I regard the novel’s importance in terms of literary significance and history. Something of the way that this novel ‘works its power’ on us is contained in an essay I published, a link to which can be found below. Many people turn their PhDs into books: I didn’t – but, again, I am always tempted to return to business that is unfinished. Maybe I shall . .